The Tour de Fleece started Saturday and like any good athlete, I did some training in preparation. Spinning training sure is more fun than other types of training. Just saying. 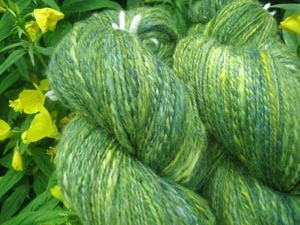 This is Nightshade, the Spunky Eclectic Fiber Club selection for the month of May. And this is Tulips, the Spunky Eclectic Fiber Club selection for the month of June. Finally, remember the vacation spinning I did? 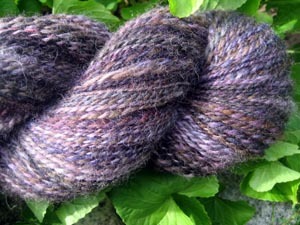 Well, I finished spinning the roving from Spinner’s Hill and plyed it up and got about 600+ yards. That’s enough for a Shetland Triangle, which is going to be my Spun Stitches knitting. I started off Saturday morning with empty bobbins and a plan to spin every day until July 29th. I’m hoping to make a significant dent in my fiber stash. Anyone want to play a game and guess how many ounces I will spin by the time the Tour de Fleece is over? There will be a fibery prize for the one who comes closest without going over. ~I’m not a particularly fast spinner. It usually takes me 2-3 sessions to spin up 4 oz. ~Anything I spin will count towards the total. In other words, it doesn’t have to be plyed and finished yarn. That’s about all I can think of to give you for hints. To enter the contest just leave a comment on this post anytime until July 29th. Hopefully you’ll have fun playing while I have fun spinning. If you are as busy as I am yet try to fit in a lot of spinning time, though say you are not a fast spinner? I a guessing 14.3 oz. Seems like you’re probably pretty committed to working on your spinning. This is the Tour de Fleece after all! My guess is 43oz. I have faith in you!! And by the way, I love the green yarn in this post! I’m not a spinner, so this is a total shot in the dark! 22 ounces. I’m going with 17 oz. Those colors are beautiful! I can’t wait to see what you produce during your Tour de Fleece! My guess is 34 ounces. Your spinning is fabulous. 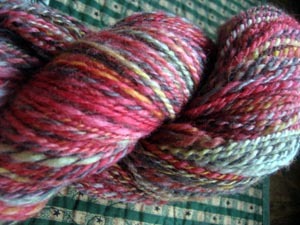 I hope when I get around to spinning my Spunky Eclectic they look as good as yours!! My guess is 52 oz.